I graduated from my undergraduate degree in 2015. I really loved my art history dissertation module and threw myself into it, which paid off as I won the Ben Hartley Award for the highest dissertation mark. I have always enjoyed writing, and I love to write about art, so with some help and encouragement from my dissertation supervisor I applied for the MRes Art History. Since then I have been working with the fantastic campaigns team here at the University of Plymouth. In my current role, I get to do loads of copywriting, proofreading, and work with designers for our publications. It’s a really fantastic mix of using my creativity and learning about all the processes that get a piece of academic literature from an idea to a physical document in your hands. My degree has not only helped me to develop professionally, but it has also helped me to develop personally. Studying at the University of Plymouth has really bolstered my confidence and reaffirmed that I was right to continue perusing a subject I was interested in rather than a more vocational degree with a clear career path. When I started I was excited to dedicate at least three years to learn more about the arts and had envisioned returning to a ‘normal job’ afterwards, happy to have had the chance to explore what I loved. That was not the plan the University of Plymouth had for me, though. I was really pleasantly surprised by all of the pastoral and academic support, the work placements in fine art, and the way in which the academics supported us and spoke to us like we were professionals. The art history team always called us art historians (in training) and it was so much easier to imagine yourself as such when people you respect and look up to speak to you in those terms. I have always had so much support and assistance from Jody Patterson, from pointers towards where to look when researching, to help bounce ideas around and how to extract and structure all the ideas in my brain into coherent ideas on a page. She is tirelessly upbeat and enthusiastic. I’m also currently applying for PhD study. It would be amazing to one day be able to assist the next art historians as Jody has helped me. Graduate schemes are tricky things and very competitive. I spent hours and hours prepping material for two, three, and four stage interviews, and then didn’t get the job. I travelled miles and, at times, had to overcome great difficulties – I went to an interview in Bath and my car's exhaust pipe fell off en route! Getting knocked back is the worst, but I wouldn’t be where I am now unless I worked on keeping the momentum going and took the feedback from unsuccessful applications on board. After three letdowns, when it came to the interview for the graduate scheme here at the University of Plymouth there was no way I wasn’t going to shout about all my skills, tout all my experience, and make sure I went over in precise detail all the reasons I’d be good at the job. The proof is in the pudding as I’m happily writing this from my desk. In my current role as part of the campaigns team, I get to help with lots of photoshoots, going out on my own with the University photographer and directing. Our current project is really exciting and showcases the work of some of the University of Plymouth;s postgraduate lecturers and students – through this project I’ve been able to speak to academics from so many different disciplines and have found out so much about the amazing work that goes on in all the different faculties. We’re going to be photographing one of our excellent professors, Camille Parmesan, in the Eden Project in December and have exciting shoots lined up on the amazing coastline around Plymouth in the New Year. Recently, we photographed Professor Angelo Cangelosi and I got to meet all of the amazing robots at the University: it was fantastic. I didn’t realise how fantastically sophisticated (and cute) they were and the robotics team were so helpful! The University is boundlessly supportive; during my time here I had help from hardship funds, the counselling team, the careers hub and, especially, from the incredible art history team. Sometimes I took a bit longer than I should asking for help, but never feel like you can’t. All that any member of staff wants is for you to succeed! Plymouth offered a mix of amazing support at the University and the playground of the South West to explore. I could be reading a book on campus at 1.15pm and be in the sea by 1.30pm. When the day is bright and sunny I used to love going out and exploring Dartmoor or Cornwall and doing my studying in the evening. I’m quite an active person and I like to run on my lunch breaks; I find it helps me to focus when I’ve had the chance to move my body and Plymouth is such a pretty place to dash around! My degrees at Plymouth have helped me to develop my confidence so much; I had a bad time at A level and hated where I went to college and Plymouth really built me back up. I was so happy and eager to learn again which was the best feeling and I’m so grateful for everything. I learned how to notice details in the world around me that help to unravel the wider stories of history, how to piece together symbols and understand subtle nuances of artwork using philosophy, sociology, feminism, Marxism, and biography, and I learned how to become an independent researcher confident enough to offer my own knowledge to the field and make sense of the visual world. No, but I did a lot of volunteering/interning during my time at university. I volunteered at The Zone and helped to facilitate arts groups for young people struggling with mental health issues, which later led to a paid role working as a youth life coach for nine months. I also interned at Peninsula Arts and got to work on the William Kentridge and Peter Randall-Page exhibitions which were very exciting! Definitely studying in the studios in the Roland Levinsky Building and at the Royal William Yard – we were so lucky to have such an incredible environment in which to work and develop our practice. Unlike other courses, having this shared space allowed my course mates and I to really bond and share in our creative processes. I really feel blessed for having had these experiences working in the studios and all the time we spent together there. Yes! Part of the joy of studying at Plymouth was to be around incredibly bright and astoundingly creative people. Many of my fellow students have stayed local and are now key players in the arts scene in Plymouth and give back through working for and with various art spaces and independent businesses such as the Ocean Studios, Bread & Roses, Studio 102, and Rockets and Rascals. 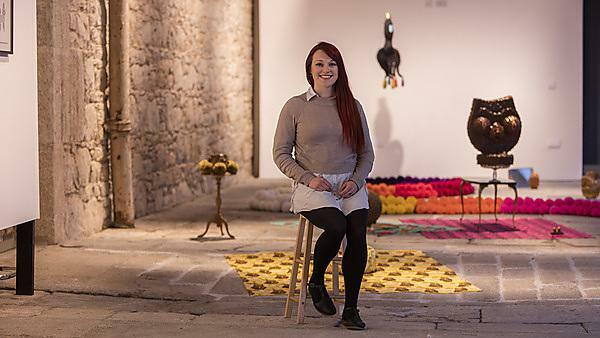 My friends Andy Meredith, Llyr Davies, and Fran Hawkesworth are part of the AA2A project this year, so current students will be working with them in the amazing Royal William Yard studio. My extraordinarily hardworking and exceedingly knowledgeable dissertation and thesis supervisor, Jody Patterson, remains a source of much support. She is very patient despite receiving millions of questions in emails from me about PhDs. I genuinely wouldn’t be anywhere near where I am without her! 100 per cent: I have loved my time here. I’m into my fifth year in the city and it’s been amazing seeing all the changes at the University and the way in which the city has grown. The arts scene here has really been vivified and it’s so exciting seeing what will come next. I have felt so at home during my studies; I remember in my first year looking around the campus and feeling so lucky that I studied here and imagining how cool it would be to do a masters degree or work here and I’ve been lucky enough to be afforded both of these treats.